For serious typing sessions—or if you just can’t get the hang of the iPad’s onscreen keyboard—an external keyboard offers the tactile advantages of real keys without sacrificing the iPad’s portability and touchscreen features. The iPad supports almost any Bluetooth keyboard, but there are now dozens of keyboards on the market that are specifically made for use with the iPad. These tend to be designed for portability, and they usually include special iPad-function F-keys for adjusting volume and screen brightness; controlling media playback; opening iOS’s Spotlight-search screen; going to the Home screen; and more—some even offer dedicated buttons for cut, copy, and paste. Most iPad keyboards are integrated into some sort of protective case, although a few are standalone accessories; regardless of design, most include rechargeable batteries that last for weeks or months. I’ve tested approximately three dozen of the iPad keyboards on the market. Here’s a quick look at the main types available, along with my recommendations for a few of the best in each category. 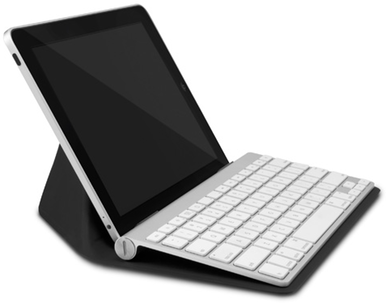 Easily the most-common type, these keyboards are integrated into a folio-style iPad case. The all-in-one design of folio keyboards is convenient, and most models make it easy to type on your lap—no desk or table required. These models also tend to include the thinnest keyboards. However, folio keyboards have a few drawbacks that can significantly affect usability and comfort. For starters, the actual keyboards tend to be cramped and have small, poor-quality keys, sometimes using odd layouts. Most also limit the iPad to landscape orientation—even though portrait orientation is often better when typing traditional documents—and a single propped-up angle. Finally, it can be inconvenient to use your iPad as a tablet while in the case, yet it’s often a hassle to remove the iPad from the case. (This also means you end up carrying the keyboard even when you don’t need it.) My recommended models attempt to avoid some of these flaws. Recommendations: Adonit’s $90 Writer (iPad, iPad 2) sports a keyboard that’s a bit cramped, but the keys are good, the clever design lets you choose a wide range of angles, and you can quickly pop out your iPad and place it in portrait orientation or use it on its own. The Writer’s cover also supports the iPad 2’s magnetic sleep/wake feature. Zagg’s $100 Zaggfolio (iPad 2) supports only a single angle, and its keyboard is slightly cramped, but the actual keys are some of the best around, and they're arranged in a standard layout. The Zaggfolio also provides solid, all-over protection while still being one of the thinnest folio keyboards on the market, and it’s available in multiple colors and materials. Honorable mentions: Apart from the Writer and Zaggfolio, most models in this category are simply bulky leather (or faux-leather) folios with a disappointing keyboard tacked onto the inside of the screen cover. Of the 16 other folio keyboards I tested, two stand out. The best is Belkin’s Keyboard Folio for iPad 2 (iPad 2; $100), which features a good-quality keyboard that you can flip behind the iPad when you want to use the tablet as a tablet; the Keyboard Folio for iPad 2 also gives you a decent range of screen angles (though no portrait mode). Kensington’s KeyFolio Pro Performance Keyboard Case (iPad 2; $100) has a pretty good keyboard and lets you rotate your iPad into portrait orientation. However, the rotation mechanism adds bulk to the case, and the single prop-up angle is too vertical for my tastes. These models hold your iPad inside a hard-plastic, clamshell case that unfolds like a laptop. The downsides to clamshell keyboard cases are that they tend to be quite bulky, and that all of the models I’ve seen use smaller-than-normal keys. But the quality of those keys is often a bit of a step up from that of the average folio-case keyboard; clamshell keyboard cases offer the most protection for your iPad; and their laptop-style design works well for typing on your lap. Most clamshells hold the iPad in landscape orientation by default, while making it relatively easy to remove the iPad and prop it in portrait orientation. However, many make it difficult to use your iPad as a tablet when you’re not typing, my recommended model being a notable exception. Honorable mentions: Best Buy house-brand Rocketfish’s Advanced Series Keyboard Capsule for Apple iPad 2 (iPad 2; $100) has better keys than the ClamCase, but its nearly vertical iPad position when open can make it difficult to see the iPad’s screen. The Advanced Series iCapsule Keyboard for Apple iPad (iPad; $100), Rocketfish’s version for the original iPad, is much bulkier, but it offers a similarly nice keyboard with an adjustable screen angle, and it’s currently available for half price if you can still find it in a Best Buy store or online. 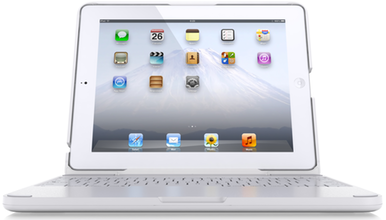 These models integrate a keyboard into a rigid shell that protects the front or back of the iPad in transit. (Most cover the iPad's screen, leaving the backside exposed.) When you’re ready to type, you pop the iPad out of the shell, stick it in a prop-up slot above the keyboard, and start typing. Most keyboard shells offer only a single prop-up angle for your iPad, though they often let you use your iPad in your choice of portrait or landscape orientation. As with clamshell-case keyboards, the keys here tend to be small, but decent; the models I've recommended here have very good keys. Keyboard shells can be used on your lap if you're careful, but they tend to be less stable than folios and clamshells. Recommendation: Unlike most keyboard shells, Logitech’s Fold-Up Keyboard for iPad 2 (iPad 2; $130) puts the keyboard in a shell that covers the back of the iPad. But that shell is compatible with Apple’s Smart Cover—together, they provide all-over protection. Even more clever is that when you press a button near the back edge of the case, and then lift up the part of the shell holding the iPad, sections of the keyboard slide out from beneath each end of the iPad, coming together in front to form a full-size keyboard. This keyboard omits F-keys, providing its iPad-specific functions via a combination of the fn key and the standard numeric keys, and I'm curious how well this elaborate, split-keyboard mechanism will hold up over lots of opening and closing. But the keys are very good, and the keyboard's full-size design makes it mighty appealing to touch typists. Honorable mentions: Logitech’s Keyboard Case for iPad 2 (iPad 2; $100) is a Logitech-branded version of the Zaggmate iPad Case with Keyboard for iPad 1 (iPad; $100) that I reviewed earlier this year. Although it’s not as good as the Zaggfolio, above, the Zaggmate is pretty good as keyboard shells go. But I was more impressed by M.I.C. Gadget’s Aluminum Keyboard Buddy Case for iPad 2 (iPad 2; $50), which offers an almost-as-good keyboard in a thinner, more-elegant design for half the price. However, the Keyboard Buddy Case is so thin and light that an iPad propped up in portrait orientation can tip over if you tap too forcefully on the screen. A standalone keyboard must be carried separately from your iPad, and it usually requires you to buy a separate iPad stand (or a case with a built-in stand). But standalone keyboards offer a number of advantages over other types of iPad keyboards—most notably, standalone keyboards often use full-size, high-quality keys arranged in a standard layout, and when you don’t need the keyboard, you can easily leave it behind to travel light. 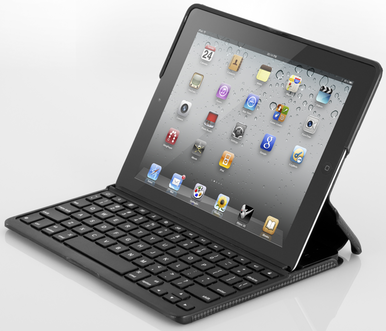 A standalone keyboard also lets you use your favorite case, and it works with any iPad, iPhone, or iPod touch. (Most can even be used with a Mac in a pinch.) For these reasons, this is my favorite type of iPad keyboard unless you frequently need to type on your lap—a task for which an integrated keyboard/case combo is better suited. Logitech’s Tablet Keyboard for iPad ($70) sports great keys, feels rock-solid, and comes with a hardshell keyboard case that flips open to double as an iPad stand. However, the keyboard is relatively heavy—with the case it weighs 21.6 ounces—and, like the Logitech Fold-Up Keyboard recommended above, it omits dedicated F-keys in favor of fn-key-modified numeral keys. Targus’s Targus Bluetooth Wireless Keyboard for iPad ($64) features large, easy-to-press keys, with a dedicated row of special-function F-keys and even an fn-key-activated embedded numeric keypad (like the one on many older PowerBooks). While the Targus keyboard isn't as solid-feeling as the Logitech model, it makes up for it by weighing just 9.6 ounces—three ounces lighter than Apple’s Wireless Keyboard (below). Honorable mention: Genius’s LuxePad 9000 Ultra-thin Bluetooth Keyboard for iPad ($60) isn’t quite as solid as the Logitech model, and it isn’t as light as the Targus keyboard, but it’s a quality product that’s available for just over $43 on Amazon.com, making it a nice budget option. Need a stand or keyboard case? If your iPad’s case doesn’t include a suitable stand, you’ll need one to prop up your iPad when using an external keyboard. My current favorite for travel is Griffin Technology’s Xpo Compact Universal Tablet Stand ($30). This stand is surprisingly sturdy, but it folds up into a tiny, 1.7-ounce package. For other options, including some nice stay-at-home stands, check out our collection of stand reviews. You might also consider a pouch or bag for carrying your keyboard. WaterField Designs offers a number of nice options. I carry the Targus keyboard recommended above in WaterField’s lightweight, padded Keyboard Socket ($15). Although not specifically designed for the iPad, Apple’s Wireless Keyboard ($69) is a great fit for the company’s tablet: The keyboard is compact, light, and sturdy, yet it offers a full-size keyboard with great keys; and many of its Mac-focused special-function keys perform similar duties when used with the iPad (namely, screen brightness, media control, and volume level; the Eject key also toggles the onscreen keyboard). Although I’ve come to prefer the Targus Bluetooth Wireless Keyboard for iPad, recommended above, thanks to its additional special-function keys and lighter weight, Apple's Wireless Keyboard remains one of the better options—especially if you’ve already got one for your Mac that you can mooch when traveling with your iPad. As with standalone keyboards, you’ll need a stand and possibly a keyboard case when using Apple’s Wireless Keyboard. My favorite solution is Incase’s Origami Workstation ($30), which encloses your Wireless Keyboard in a sturdy travel case that unfolds into a solid iPad stand when it’s time to get to work. The stand even works for typing on your lap. Dan Frakes is a Macworld senior editor.